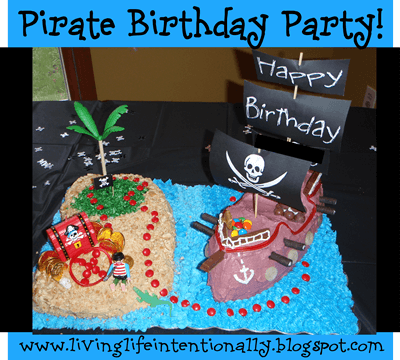 Kids pirate birthday party with lots of ideas for pirate cakes, pirate themed food, pirate games for kids and more! 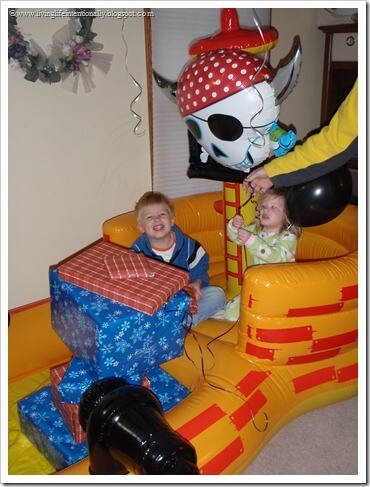 This Pirate Birthday Party was sooooo much fun to plan! 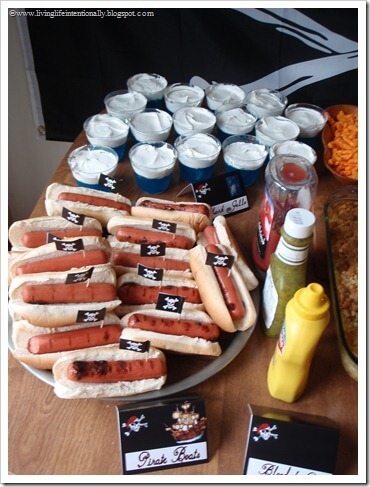 Our boy was turning 5 & he loved pirates so…. So bummed I didn’t take a picture of the invitation – what was I thinking?!?! The party invitation had Goofy’s picture in a pirate costume with the words “Beware of Pirates.” The party details were on the back. 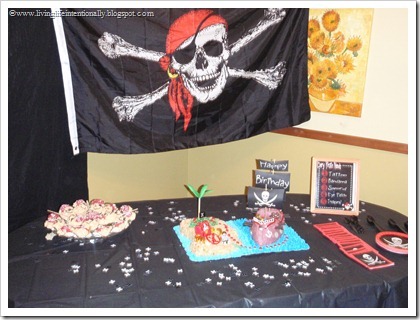 This is the cake table with yet another pirate flag & some pirate plates. 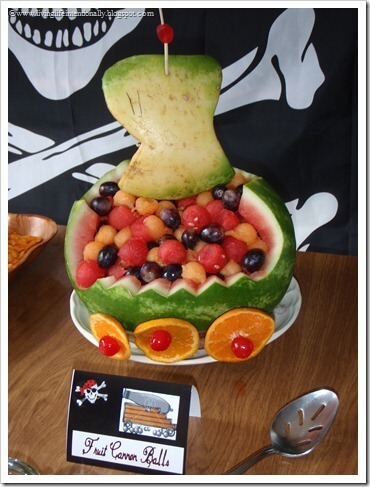 For food I made a Watermelon pirate ship with balled watermelon, cantaloupe & grapes inside. I got lots of ohs & ahs! 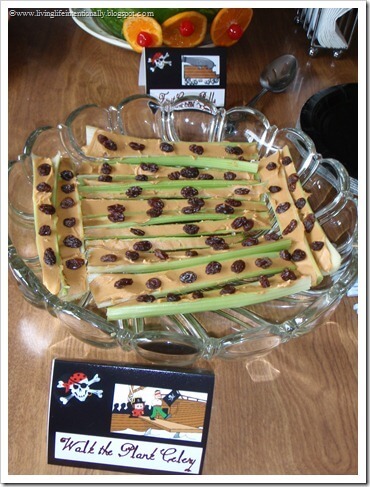 Finally, we served Pirate Boats (hot dots) and Fish in the Ocean (gummy fish in blue jello & cool whip sea foam). The food was all a BIG hit! 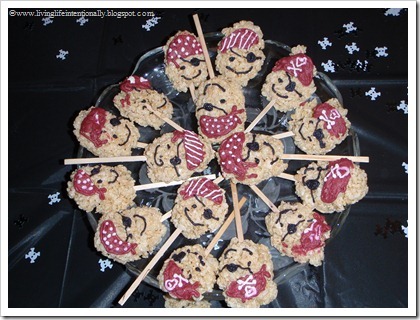 These Krispy Pirate Pops were fun to make! They were the parting gift for the adults. I also have framed What Every Pirate Needs (i.e. 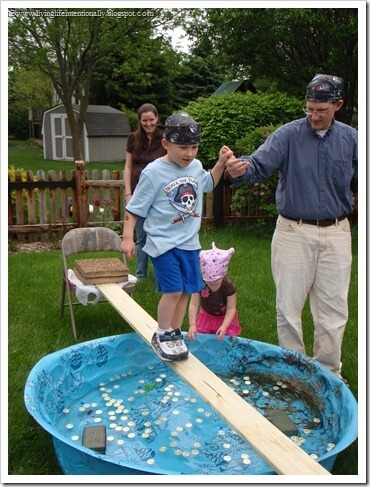 compass, eye patch, etc) and after each game the kids got another pirate necessity. The cake was fun to make! I made a small rectangle & cut off parts to make the island shape. I frosted & used coconut for sand. 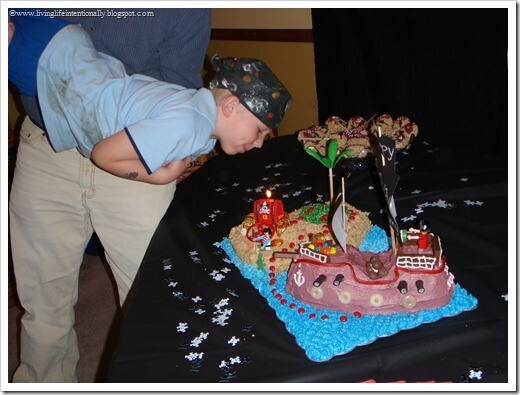 The ship was from a cake mold that I decorate with candy (including malt ball cannons!) I made the mast & sails on the computer. I piped blue frosting around the island & ship to make water. Finally, I added some of my son’s Play Mobil Pirate figures & whala! Being a pirate party we had to have a treasure hunt! I made picture clues since most of the guests couldn’t read. 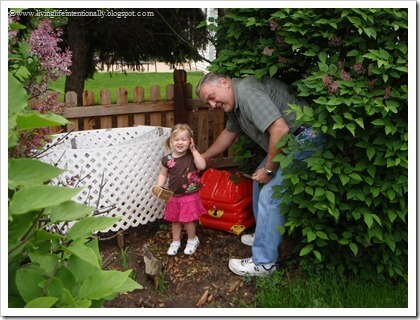 They each took an adult with them and ran all around our house & yard. At the end was a treasure box with some chocolate gold coins. It was a BLAST! When Goofy woke up in the morning he came down to this fun inflatable pirate pool in our living room! They had SO much fun playing in the pirate ship. In our family we have a tradition – the birthday kid gets a fun themed Mylar balloon – this year Goofy got the pirate skull – he LOVED it! That was fun & exhausting (I was 6 months pregnant with Tinker Bell at the time!)! With a May birthday you never know if the weather is going to cooperate so we worried a lot up to the party – but it was a great day! I wonder what theme we’ll do next year?